The Lake Oswego girls basketball team wasn't going to wait. The Lakers, hosting Milwaukie in the first round of the Nike Interstate Shootout at Lake Oswego High School on Dec. 26, started their game at a dead sprint, racked up a 17-point lead in the first quarter and rolled home to win 63-44 from there. After their victory, the Lakers said that — in addition to getting the win — the team is focused on improving and getting ready for Three Rivers League play. "Something we're working on a lot is higher percentage shots, so not the first or second look, but the third or fourth," said senior guard Taylor Anders, who led her team in scoring with 18 points. "So we're working on ball movement and getting shots that are closer in and stuff like that." "We didn't really know that much about Milwaukie so that's kind of where we came in," added junior wing Megan Woolard, who finished with 11 points. "Against league opponents, it's more game-plan oriented, but this was more like 'We'll just do our thing and adjust accordingly.'" With the win, Lake Oswego snapped a four-game losing streak and improved its non-league record to 3-5. Milwaukie, meanwhile, lost for the third straight time and fell to 1-5 overall. The Lakers were tough as nails at the start of their contest against the Mustangs, forcing 10 first-quarter turnovers and turning those Milwaukie miscues into 10 points at the other end. Senior guard Katy Gilbert got things started with a pair of free throws, and one possession later, Woolard took a pass from sophomore Macy Douglass and buried a 3-pointer from the right wing to make it 5-0. One minute later, sophomore wing Janie Ruttert hit a pull-up in the lane, and after a Gilbert steal, Anders took a long pass from Gilbert and scored on the fast break to make it 9-0. Freshman Kate Anders added a foul shot to push the lead to 11-0 with 4 minutes, 41 seconds to go in the period before Milwaukie finally got on the scoreboard. Following a missed Lake Oswego shot, Mustang sophomore Jaydyn Tuel took a pass from freshman Cali Denson and scored on the break to make it 10-2. It got worse for the Mustangs before it got better, though. Over the next 2:51, Lake Oswego stitched together a 9-0 run that boosted its lead to a commanding 19-2 margin. Kate Anders got things started there with a jumpshot from the right side of the floor, Taylor Anders hit two free throws, Gilbert hit a pull-up, Ruttert knocked down another jumpshot and Gilbert added one of two free throws with 1:03 left in the period for that 19-2 edge. "We don't really know what our opponents are going to be like, but at the end of the day, we just need to work our hardest because there's not just one or two good girls (on TRL teams), every girl is going to get their buckets so we just have to work on lockdown defense against everybody, and once we get on offense, it's about sharing the ball and getting the best look," Taylor Anders said. Milwaukie — led by Denson's game-high 24 points — got its offense into gear after that, outscored the Lakers 11-9 in the second quarter and closed within 28-13 at the half. But the Lakers made sure the Mustangs got no closer, outscoring Milwaukie 15-11 in the third quarter to push its lead to 43-24. Taylor Anders had eight points in that third quarter, then added another six in the fourth as the Lakers closed out the game. Denson went off in the fourth quarter with four 3-pointers and 14 points, but it was too little, too late. "We put in a whole new offense this year, with the new coaching staff, and I think that offense in general promotes a lot of cooperation and working with teammates which is what we didn't have last year," Woolard said. 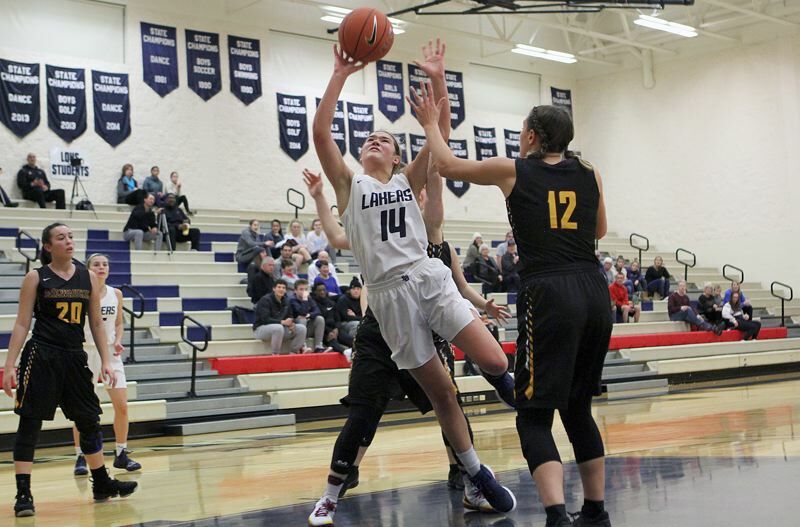 Gilbert added 13 points in the win for Lake Oswego and Ruttert eight. For Milwaukie, MaKenna Pressley was the Mustangs' second-leading scorer with seven points.